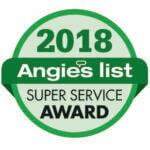 Magic Touch Mechanical Wins Angie’s List Award! Magic Touch Mechanical is highly rated in multiple service categories on Angie’s List in the Phoenix area. We received our very first Angie’s List Member review 13-years ago. Since that time, hundreds upon hundreds of members have reviewed their experience with Magic Touch. The overwhelming majority of members rate their experience an “A” (the highest possible rating). Members from Chandler to Peoria have shared their experience with other members about Magic Touch’s service…and they’re happy! Their happiness beats even the prettiest award. Every year, Angie’s List gives companies in the top 5% of each category an award for providing exemplary service. They call this award the Super Service Award. Not only has Magic Touch earned this prestigious award for many back-to-back years, we’ve received multiple awards per year!Considering Angie’s List says only 5% of companies on their list earn this award – winning several categories is huge. “It’s something we’re all very proud of around here.” says Field Operations Manager, Rick Barrow. Even though our trophy case is full of these awards and many others, that’s not what we care about. What we’re truly passionate about is practically overwhelming our client with great service. Our “product” isn’t the A/C unit, fireplace repair, or insulation… our product is “customer service”. When the overwhelming majority of our customers rate us with the highest possible grade and a kind review – we’re reaching our goal! A Special Thanks, From the Magic Touch Mechanical Team! To all of the customers who take the time out of their day to review Magic Touch Mechanical – THANK YOU! From the bottom of our hearts, we sincerely appreciate all the support and loyalty from so many & for so long. We want to earn your business and 5-star review as well! Magic Touch Mechanical provides service to the entire greater Phoenix metro area and surrounding cities. We are located in Mesa, AZ. And provide same day service in most cases within a 35-mile radius. Whether you need you’re A/C unit serviced or replaced, attic insulation, or even fireplace repair – we’ll work hard to exceed your expectations. CONTACT MAGIC TOUCH MECHANICAL TODAY!